The shark bested the humans in this incident. Horrifying stories of marine animals being killed so that beachgoers can take selfies with them have been surfacing for more than a year now, and yet many others have not learned their lesson: don’t mess with animals for photos. 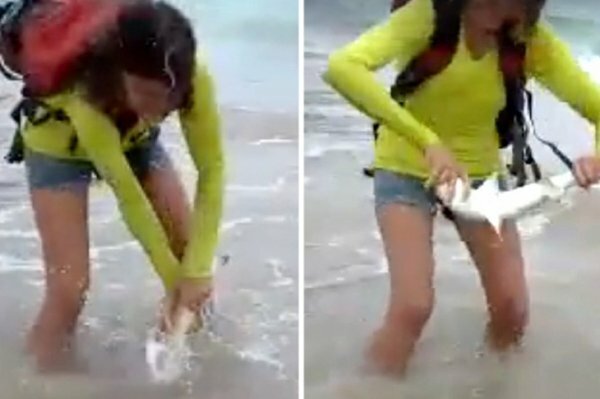 Most of the time, it’s babies that have become stranded and are in need of help that are targeted and wind up dead, and that’s exactly what might have happened to this baby shark that was grabbed by tourists in Brazil. This past Monday, a couple from the mainland were on vacation on the Brazilian island of Fernando de Noronha when they happened upon a tiny lemon shark on the shore. Rather than leaving the shark be, as should always be done with animals that aren’t clearly in need of help, the woman seeks out the shark and yanks it out of the water. Almost instantly, the thrashing shark bites down on the woman’s free hand and refuses to let go, even when the woman submerges the shark back in the water. The husband rushes forward to help his wife free herself of the shark, but in the process decides to take some up-close photos of the shark with its mouth around her hand. The poor shark is handled aggressively as they try to pry his mouth open, which they eventually succeed in doing. The woman then swings the shark in the air a couple of times before throwing him farther out into the ocean. Though the shark does make it out alive in the end, something which cannot be said of the many other shark/human encounters, it’s still horrible that he had to endure this trauma for the sake of taking photos. The woman also made it out alive but she received four stitches to her hand as well as some fines that were slapped on both her and her husband after the incident. Lemon sharks are a protected species, so messing with them comes at a cost of $1,600, which is pretty hefty in itself. However, since the area where the couple picked up the shark is in a protected marine area, fines can double from this stunt and they did. Both the man and woman were ordered to pay $3,200 each. Hopefully the photos were worth it. Watch the video of the encounter below. This article (Tourists Take Selfie With A Baby Shark, But This Time The Shark Won) is free and open source. You have permission to republish this article under a Creative Commons license with attribution to the author and True Activist.
? Trump’s National Security Adviser Has Just Resigned Over His Contacts With Russia In 1941 Henry Ford Invented a Cellulose-Plastic Prototype Car Fuelled By Hemp and Vegetable Seed Oils ?